Frankly, Comedy Central and Stephen Colbert (who currently hosts The Late Show with Stephen Colbert) can make arrangements with charities and advertisers, alike, if they so choose, but the American people are now much more keenly aware of the networks’ business dealings, thanks in part to Wikileaks’ leak of Podesta’s emails. Craig Minassian, Chief Communications Officer for the Clinton Foundation’s “Clinton Global Initiative”, wrote Podesta a post-production email about a few episodes The Colbert Report did promoting CGI University. Much like “Trump University,” the “CGI University” is no university at all, but rather, “hosts a meeting where students, university representatives, topic experts, and celebrities come together to discuss and develop innovative solutions to pressing global challenges,” according to its website. But it’s Minassian’s choice of words, in his email to Podesta, which is now raising eyebrows. “John, I hope you got a chance to see The Colbert Report‘s two special episodes I had them do about CGI U that we taped in St. Louis this weekend,” the email reads, implying Minassian has some power and influence over the direction, content, and substance in the production of The Colbert Report. “I had them do,” is what is written. Wait! What? Requesting feedback is often done when someone is a subordinate, to a more powerful person, such as Podesta. Could it be that Minassian was asking for praise or some sort of constructive criticism? If so, why? And then he goes on to suggest he has the power and influence necessary to get Podesta on the show as well. 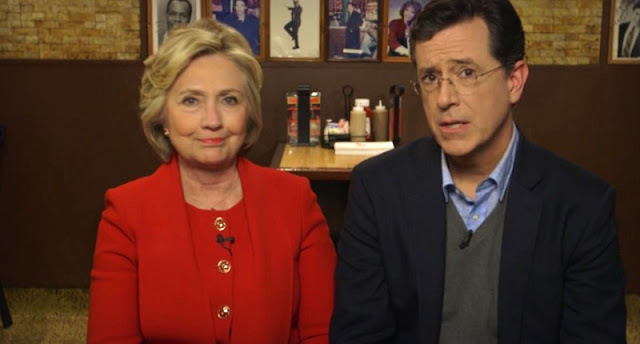 He wrote, “Next will be your Colbert appearance!” The thought may be disturbing to some who’d like to think their comedy shows aren’t being used to program their minds into believing a certain way about the Clinton Foundation and its activities. It is important to point out that because we are pointing out corruption within the Clinton camp and Comedy Central that the Free Thought Project is not promoting Donald Trump. It is entirely possible to bipartisanly call out corruption, and here at the Free Thought Project, that is what we do — regardless of party affiliation. Leaked emails implicated both Hillary Clinton’s state department (under Obama) and The Clinton Foundation of collusion and convolution of the lines between official government business and the work of the foundation. According to the Christian Science Monitor, “At least 85 people from private interests who had donated to the Clinton Foundation met with Clinton while she was secretary of State, according to an Associated Press review of her calendars.” Whether or not those meetings constituted a “pay-to-play” scheme is a matter for a judge and jury to decide, should it ever come to that. Returning back to the influence the CGI had over at Comedy Central, from the Podesta emails one might easily conclude that not only was the Clinton Foundation actively at work attempting to promote its public image, it was using comedy to do so, possibly to desensitize younger viewers to explosive allegations of the foundation’s mismanagement of funds. Over the years, there were a number of videos produced by the Comedy Channel, featuring either Bill Clinton or daughter, Chelsea. Daughter Chelsea was a guest on Jon Stewart’s The Daily Show in September of 2013, praising the work of the foundation of which she is vice president, just a few months after father Bill was featured with Colbert. However, it must be noted, Stewart often suspiciously mocked the Clinton’s money troubles at the foundation, with a wink and a nod at suggestions their money woes were a simple oversight. The allegations the Clintons, their foundation, and secretary Clinton all engaged in a pay-to-play scheme to give access and special favors to donors, and capitalize on donations made to the foundation, may have come to a head when former Senate President of Haiti, Bernard Sansaricq declared at a press conference in September of 2016 that the Clinton Foundation gave less than 2% of the over 14 billion dollars donated to the CF for the relief efforts to Haiti following a devastating 2010 earthquake which killed somewhere between 100,000 and 160,000 people, destroying homes and displacing over 500,000 people.